The optic nerve head is formed from a coalescence of 1 million axons from the retinal ganglion cells. An altitudinal visual field defect is suggestive of ischemic optic neuropathy but may also be seen in idiopathic optic neuritis. Ischemic optic neuropathy is the result of posterior ciliary artery occlusion. 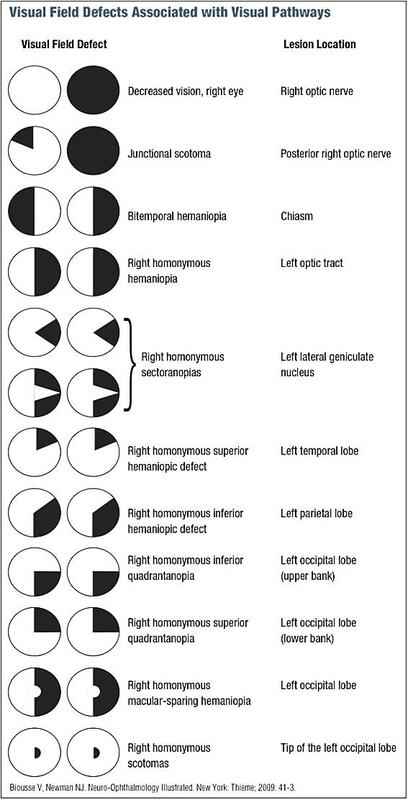 90% of ischemic optic neuropathy are nonarteritic and related to a congenitally small optic cup and 10% may have underlying giant cell arteritis. Oculomotor complex is located in the dorsal midbrain, anterior to the cerebral aqueduct. The superior rectus receives information from the contralateral superior rectus subnuclei, but the rest of the innervation of the third nerve is ipsilateral. As the oculomotor nerve enters the orbit, it separates into the superior and inferior divisions. The superior division innervates the levator palpebrae and superior rectus, whereas the inferior division innervates the papillary sphincter, medial and inferior recti, and the inferior oblique. Trochlear nerve floats freely in the cavernous sinus lateral to the internal carotid artery, as opposed to the third and fourth nerves, which are in the lateral wall of the sinus. Triad of dilated pupil with poor or absent response to light but preserved near response, loss of deep tendon reflexes, and abnormalities of sweating.